Newcastle United have announced a surprise friendly with CSKA Moscow - and supporters will be able to watch the Magpies in action. 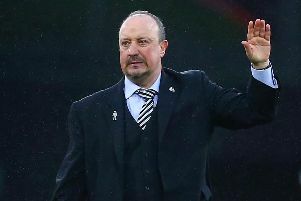 The friendly will fill the void left by an empty weekend after Rafa Benitez's side crashed out the FA Cup to Watford. Newcastle's clash with the Russians on February 16 will top-off a five-day training camp at the 3,500-capacity Pinatar Arena, near Murcia. Benitez took the Magpies to the same venue last season, where a number of supporters watched the side play out a 1-1 draw with Royal Antwerp. And Newcastle fans are once again able to watch their side in Spain with the club confirming that supporters are welcome to attend the friendly. Tickets are available on the day with adult admission priced at five euros, while access for children (under-16s) is free of charge. Supporters will, however, have to shell out for flights should they wish to make the journey to the Pinatar Arena. Murcia is the nearest airport to the stadium, but many opt to fly for Alicante due to cheaper flights - despite it being further away from the venue itself.